Opera Up Close provides an in-depth look at the upcoming production, with the artists that make them happen, at Pittsburgh Opera Headquarters in the Strip District, at 2:00 PM on Sundays before the opening of each production. Admission to Opera Up Close is $5, or free to members of FRIENDS of Pittsburgh Opera, New Guard and donors at $50+. 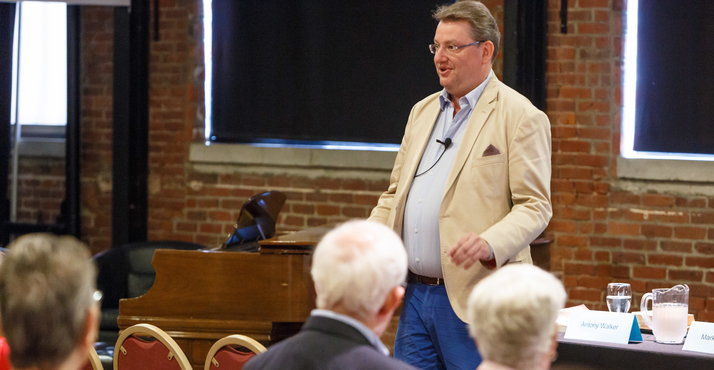 Maestro Antony Walker speaks at a 2017 Opera Up Close event at Pittsburgh Opera Headquarters.